One of the best short-term savings vehicles is the 6-month CD: a certificate of deposit with a six-month term. 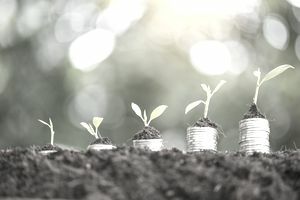 Savers and investors who buy 6-month CDs are typically looking for interest rates on deposits that are higher than more liquid financial products, such as a standard savings account. They may also want to build a CD ladder during times of rising interest rates. Certificates of deposit, or CDs, are deposit accounts that pay a stated interest rate for a certain period of time, which is the term of the CD. CDs usually have a minimum deposit amount, such as $1,000, and the bank or financial institution will typically charge a fee if the CD holder withdraws principal before the end of the term, also known as the maturity date. For example, if you deposit $1,000 into a 6-month CD that has an annual percentage yield (APY) of two percent, your interest at the end of the term, assuming only one interest payment is made, will be $10, making your ending balance $1,010. Some banks may make monthly interest payments that are compounded, which means you could earn more than $10 during that period. At the end of the term just before maturity, the CD holder has the option of renewing the CD for another term. This decision would be appropriate if the CD holder does not need their money within the next six months. The most common CD terms are 6-month, one-year, 18-month, two-year, and five-year CDs. In general, the longer the term of the CD, the higher the interest rate paid to the CD holder. Therefore, if you want to buy a 6-month CD, it usually means that your savings objective is short-term. More specifically, if you need the money for a purpose within one year but not less than six months, a 6-month CD can be a smart choice for you. Liquidity: If you need access to your principle in the short term, a 6-month CD has an advantage over CDs with longer maturities because withdrawals before maturity will incur an early withdrawal fee or penalty. Therefore, 6-month CDs are more liquid than CDs with longer maturities. Higher Interest Rates Than Savings Accounts: Cash accounts at banks either pay no interest, or they pay interest rates that are near zero, such as 0.1 percent. In simple interest, that's one penny per year for every $100 on deposit. 6-month CDs may pay an APY of one percent, two percent, or more. Investing for Rising Interest Rates: When interest rates are rising, the rates on short-term deposits are also increasing. For this reason, shorter maturity dates have an advantage over longer maturity dates in a rising rate environment. Early Withdrawal Penalties: If you need to withdraw cash from your 6-month CD before the maturity date (within 6 months of the initial deposit), the financial institution where you hold the CD will charge an early withdrawal penalty. For CDs with less than one-year maturities, banks typically charge three months of interest. Low-Interest Rates: While 6-month CDs do pay higher interest than the average savings account at a bank, the interest rates are almost always lower than CDs with longer maturities. Before buying a 6-month CD, be sure to review the advantages and disadvantages carefully. Individuals or businesses wanting to earn higher rates of interest on deposits not needed for at least six months may benefit from buying 6-month CDs. When interest rates are rising, savers and investors wanting to take advantage of higher renewal rates may also consider buying 6-month CDs.